We created a new data set comprising the universe of all 3,649 named metropolitan agglomerations and cities that had populations in excess of 100,000 in the year 2000, their populations in that year, and their built-up area identified in the MOD500 map, currently the best satellite-based global map of urban land cover. Using this data set, we estimated urban land cover in smaller cities and towns in all countries and calculated total urban land cover in every country in the year 2000. We then employed multiple regression models that could explain more than 90 percent of the variations in urban land cover among countries. 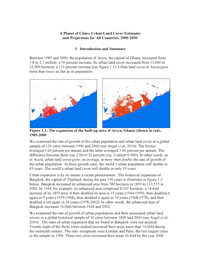 Then, using U.N. urban population projections in combination with three realistic density change scenarios based on our previous global and historical study of densities, we projected urban land cover in every country and world region from 2000 to 2050.